In this article we review what we believe to be the best mattress topper for a single bed. Now you can of course buy mattress toppers for the many different bed sizes. However in this article we review just those toppers designed to fit on a standard single bed size. Always check though before buying the exact size of your single bed. Manufacturers can make single beds in slightly different sizes. The majority of mattress toppers for single beds are designed to fit the "standard single bed size." It is also worth noting that many UK buyers also buy these to place on a sofa, or a sofa bed, as that helps a lot in making the sofa much more comfortable to sleep on. Some buyers also buy one of these to help slightly soften an orthopaedic mattress if they find that just too hard. Quite a few UK buyers also use these to improve the quality of bunk beds. Likewise many people who like to camp will use one of these for a camping bed and even inside a sleeping bag. We have listed below the best of the best according to actual real life buyers. We looked at the many of these that were on sale, and picked out those that got the highest reviews. We have then listed the mattress toppers in that order. 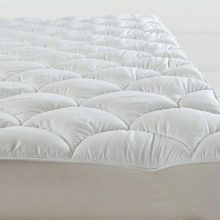 Just below you can find a more detailed review on each of these top rated mattress toppers. It has elasticated corner straps for a secure fit to keep the topper in place on your mattress. The corner straps fit a mattress depth of up to 30 cm. People do buy these toppers for a range of reasons. The most common reason is to help soften up a hard mattress, or to help add some comfort to an older mattress. A good quality mattress for a single bed can cost around £100. Many of these toppers cost between £20-30, so that of course is a more affordable option for most people. They do vary in thickness quite a bit, and it is clear from reading so many reviews, that buyers do prefer those with a deeper thickness. These are really all about adding some comfort, and to help you get a good night's sleep. This is actually a very difficult question to answer. The reason it is so hard to answer is that there are many different types of bad back problems. There really is no one single answer as it very much depends on the individual's back problem. To get relief and a good night's sleep, it can often be trial and error until you find something that works for you. When reading through the many reviews, most back pain sufferers tended to like the first one on our list.